Summary: More of the same. Fans of the formula aren't going to find much fault here. Lieutenant Horatio Caine (Caruso) and his crack team of crime scene detectives return to deal with the nasty side of the sun-kissed city of Miami for the eighth season of the hit American television show that seems to have no end of appeal. Still raking in millions of viewings, this season continues the mix of quirky murders among the more gritty storylines – in particular the first episode in a three-way crossover between all CSI series. It’s not enough to elevate the 24 stories above average fare for CSI: Miami or even the franchise in general as the cast seem to be going through their usual paces. The murder plots themselves take in a range of victims and cold-blooded killers in odd scenarios. Early in the season there is talk of middle-aged women “cougars” preying on teenage boys as a beach volleyball team is electrocuted, sparking the revelations of a web of jealousy which could easily be lifted from a soap opera. Likewise a plot which sees two repo man try to take off with a plane that carried a dead man stuck down its loo verges on the daft. Things get far more serious with the first part of the CSI: Trilogy when Dr Raymond Langston (Laurence Fishburne) flies in from Las Vegas, however the two other parts it sets up so well won’t be found in this box set. 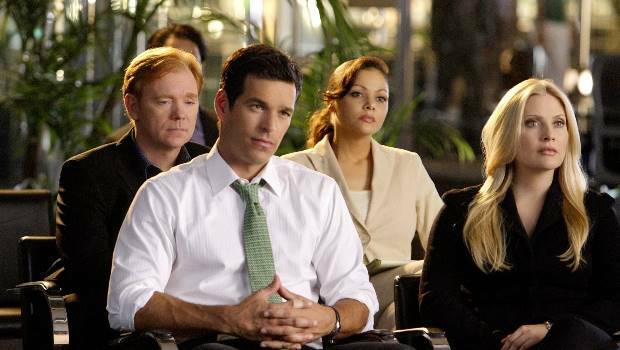 Jellyfish used as murder weapons, a body falling from the sky and the killing of a hated receptionist sit between other serious episodes such as Horatio’s son getting involved in solving a murder and Eric Delko (Rodriguez) takes centre stage for many of the tense moments including the opening episode which concludes the series seven finale. CSI: Miami is largely on cruise control for this season – there are very few surprises among the team – and there is a sense more could be done to freshen up the series. But CSI has been going a long time and fans of the formula aren’t going to find much fault here.